At 5-2, the Raiders are sitting atop the AFC West, tied with the Denver Broncos, and Oakland fans are finally starting to believe this will be the year their team gets into the postseason for the first time since 2002. Yet not everyone is sold on the Raiders’ chances. This week, analysts from ESPN and Football Outsiders projected the Raiders to have a 15 percent chance of winning the division and a 46 percent chance to make the playoffs. They also predict the Raiders will finish with a 9-7 record, meaning they would go 4-5 over the final nine games of 2016. Those same analysts predict the Broncos to go 6-3 over the rest of the season to finish at 11-5. They give the defending Super Bowl champs a 55 percent chance to win the division and 83 percent chance of making the playoffs. The Kansas City Chiefs (23 percent) also are considered more likely to win the AFC West than Oakland, according to the analysts. From a schedule standpoint, the rest of the Raiders’ games certainly do seem to present a high hurdle. The remaining games: at Tampa Bay (3-3) this Sunday, followed by games vs. Denver (5-2), Houston (4-3), Carolina (1-5), Buffalo (4-3), Kansas City (4-2), San Diego (3-4), Indianapolis (3-4) and Denver again. Opponents in six of the nine games have winning records, and three of those games are against the Super Bowl teams of last season (Denver and Carolina). By contrast, over the first seven games this season, all five Raiders wins came against teams that now have losing records. The two losses (vs. Atlanta and Kansas City) were to teams with winning records. 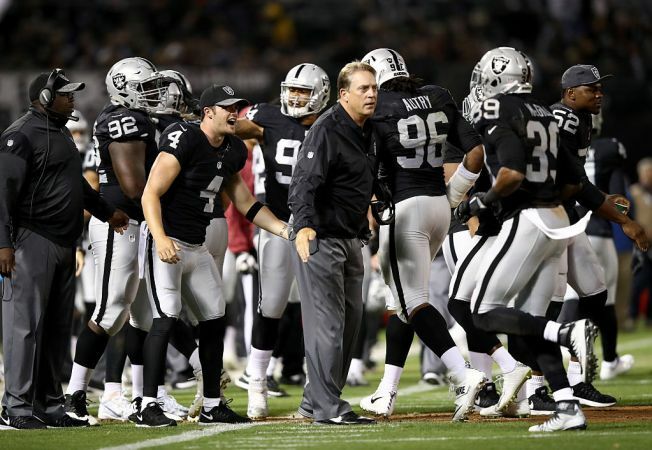 Raiders head coach Jack Del Rio, however, loves the feeling he gets from this team. The Raiders have pulled off some clutch victories, and he says a feeling of confidence is building. Plus, he says he knows his players believe they must still work hard to get better. They’re not resting on what they’ve done over just seven games. Sunday’s game at Tampa Bay is scheduled to kick off at 10 a.m. in the Bay Area.